Kings Lynn, Norfolk is one of the few (or only) towns in Norfolk which is home to it’s very own sausage blog! 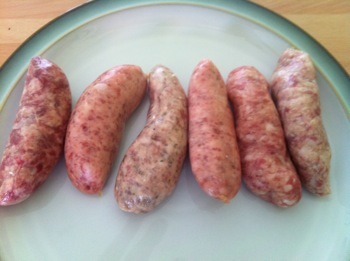 Rate My Sausage do an excellent job of sharing the wealth about sausages in Norfolk and Suffolk, and those from further afield. What town could be more perfect for an undercover visit! Here are Kings Lynn’s finest lined up ready to do battle later. Sausage makers visited included; Kings, Van Pelt Pork, Prior E H & Sons, Bowers, Vancouver Butchers and Giffens. It was a beautiful day to be “roaring” about on the CG125! The map below shows my route. You would be forgiven for wondering why I didn’t just go straight there and back. A big part of today’s adventure was visiting the Pork Pie Queen! More on that soon. We are by your presence honoured, as Yoda would say (he likes sausages). Hopefully at least one of the sausages you harvested will be “out of this world”. As you know, Bowers are the current Kings Of The Bangers in Lynn, I’ll be interested to find out if others have raised their game. This taste test, by someone who actually knows what they’re talking about unlike me, will be akin to qualifying before a grand prix. I’d rather not speculate on the result in public, if that’s OK with you. I’ll email my thoughts. It’s a good looking starting grid you have assembled! You are too modest – I think you do know what you are talking about and, as you know, I always enjoy your reviews. Had I had more time I would have sought you out today and bought you a coffee too. Just had another thought – do you have a date for KoTB 2011 yet? Perhaps I will keep the results secret until after that? There’s no date set yet Your Highness, but I’ve pitched to potential venues. Thing is, “fancy a sausage competition?” isn’t the greatest opener to a conversation…. Please go ahead and publish! Not only am I keen to hear your opinions, but it will add some zing to the competition.